Find the English description of the Scrum Values below. The international descriptions of the Scrum Values is available as a free download (PDF): The Scrum Values (International versions). Scrum is a framework upon which people and organizations develop a working process that is specific and appropriate to their time and context. The rules and principles of Scrum all serve empiricism, or empirical process control, as most optimal in dealing with complex challenges in complex circumstances. There is however more than the rules and the principles. 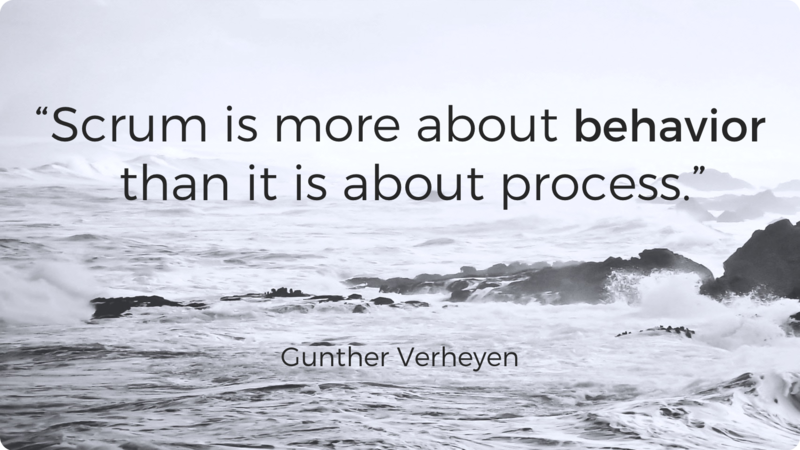 Scrum is more about behavior than it is about process. The framework of Scrum is based upon five core values. Although these values were not invented as a part of Scrum, and are not exclusive to Scrum, they do give direction to the work, behavior and actions in Scrum. Values drive behavior. Scrum is a framework of rules, principles and… values. The general definition of ‘commitment’ is “the state or quality of being dedicated to a cause, activity, etc.”. It can be illustrated by a team’s trainer stating “I could not fault my players for commitment” (although they might have just lost a game). This describes exactly how commitment is intended in Scrum. Commitment is about dedication and applies to the actions and the intensity of the effort. It is not about the final result, as this in itself is often uncertain and unpredictable for complex challenges in complex circumstances. Yet, there was a widely spread misinterpretation of the word commitment in a context of Scrum. This originates mainly from the past expectation of the Scrum framework that said teams should ‘commit’ to a Sprint. Through the lens of the traditional, industrial paradigm this was wrongly translated into an expectation that all scope selected at the Sprint Planning would be completed by the end of the Sprint, no matter. ‘Commitment’ was wrongly converted into a hard-coded contract. In the complex, creative and highly unpredictable world of new product development, a promise of exact scope against time and budget is not possible. Too many variables influencing the outcome are unknown or may behave in unpredictable ways. To better reflect the original intent and connect more effectively to empiricism, ‘commitment’ in the context of scope for a Sprint was replaced with ‘forecast’. The players commit to the team. Commit to quality. Commit to collaborate. Commit to learn. Commit to do the best they can, every day again. Commit to the Sprint Goal. Commit to act as professionals. Commit to self-organize. Commit to excellence. Commit to the Agile values and principles. Commit to create working versions of product. Commit to look for improvements. Commit to the definition of Done. Commit to the Scrum framework. Commit to focus on value. Commit to finish work. Commit to inspect and adapt. Commit to transparency. Commit to challenge the status-quo. The balanced but distinct accountabilities of Scrum enable all players to focus on their expertise. The time-boxing of Scrum encourages the players to focus on what’s most important now without being bothered by considerations of what might stand a chance of becoming important at some point in the future. They focus on what they know now. YAGNI (‘You Ain’t Gonna Need It’), a principle from eXtreme Programming, helps in retaining that focus. The players focus on what’s imminent as the future is highly uncertain and they want to learn from the present in order to gain experience for future work. They focus on the work needed to get things done. They focus on the simplest thing that might possibly work. The Sprint Goal gives focus to a period of 4 weeks, or less. Within that period, the Daily Scrum helps people collaboratively focus on the immediate daily work needed to make the best possible progress towards the Sprint Goal. The empiricism of Scrum requires transparency, openness, and honesty. The player-inspectors want to check on the current situation in order to make sensible adaptations. The players are open about their work, progress, learnings and problems. But they are also open for people, and working with people; acknowledging people to be people, and not ‘resources’, robots, cogs or replaceable pieces of machinery. The players are open to collaborate across disciplines, skills and job descriptions. They are open to collaborate with stakeholders and the wider environment. Open in sharing feedback and learning from one another. They are open for change as the organization and the world in which they operate change; unpredictably, unexpectedly and constantly. The broader Scrum ecosystem thrives on respect for people, their experience and their personal background. The players respect diversity. They respect different opinions. They respect each other’s skills, expertise and insights. They respect the wider environment by not behaving as an isolated entity in the world. They respect the fact that customers change their mind. They show respect for the sponsors by not building or keeping functions that are never used and that increase the cost of the product. They show respect by not wasting money on things that are not valuable, not appreciated or might never be implemented or used anyhow. They show respect for users by fixing their problems. 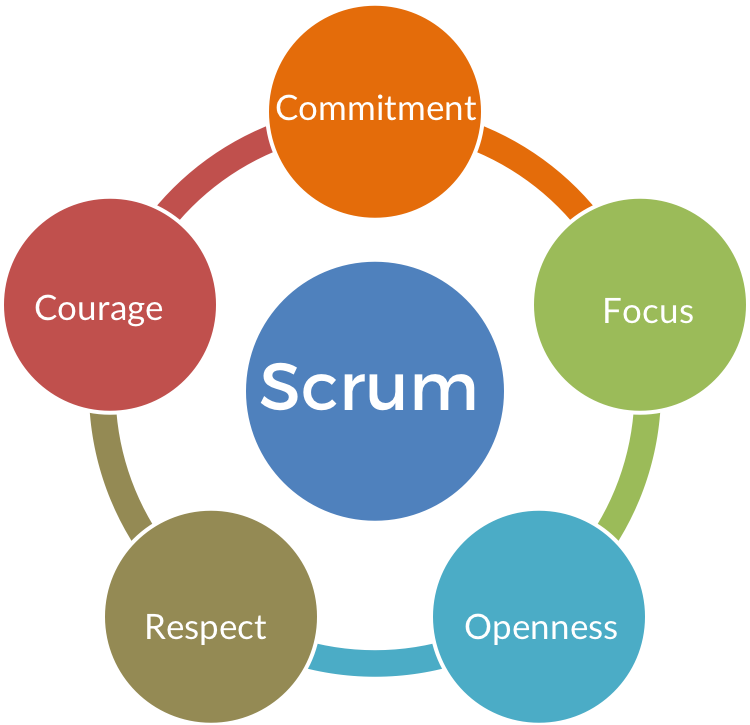 All players respect the Scrum framework. They respect the accountabilities of Scrum. The players show courage by not building stuff that nobody wants. Courage in admitting that requirements will never be perfect and that no plan can capture reality and complexity. They show the courage to consider change as a source of inspiration and innovation. Courage to not deliver undone versions of product. Courage in sharing all possible information that might help the team and the organization. Courage in admitting that nobody is perfect. Courage to change direction. Courage to share risks and benefits. Courage to let go of the feint certainties of the past. The players show courage in promoting Scrum and empiricism to deal with complexity. They show courage to support the Scrum Values. The courage to take a decision, act and make progress, not grind. And even more courage to change that decision. 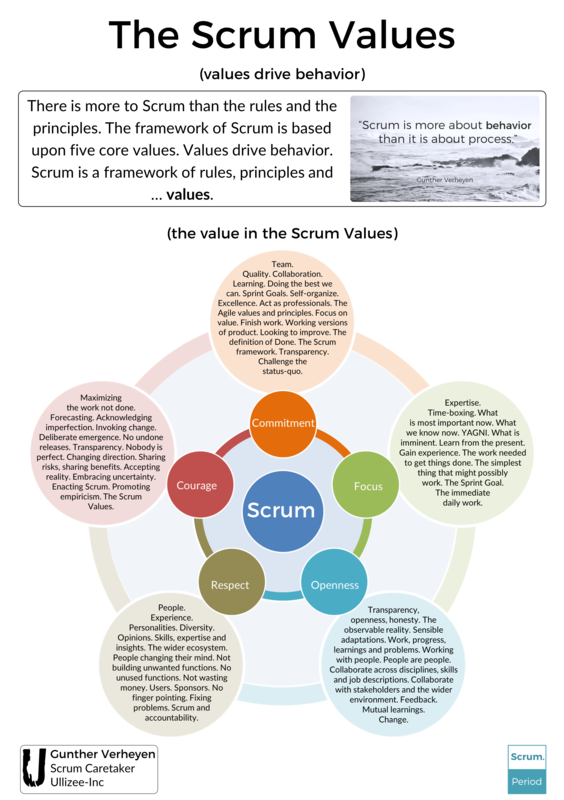 A poster of the Scrum Values is available as a free download (PNG): The Scrum Values (poster). 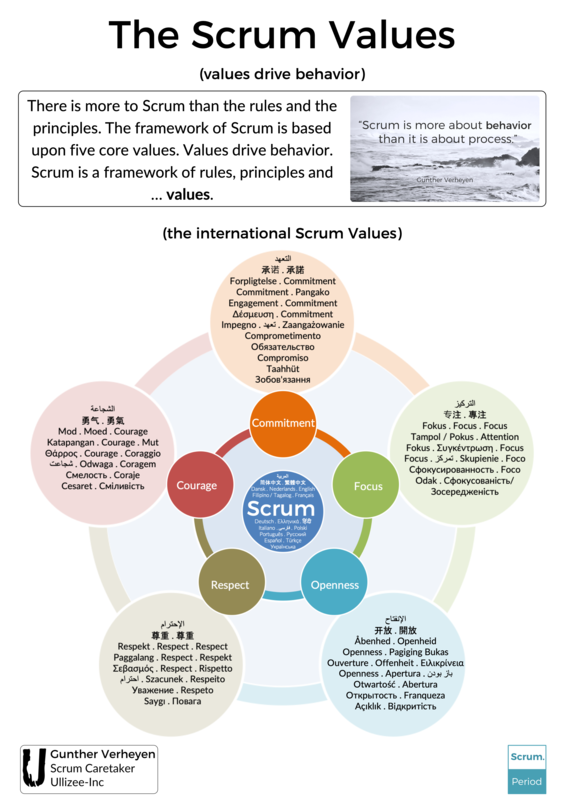 A poster of the international versions of the Scrum Values is also available as a free download (PNG): The Scrum Values (International Versions poster).